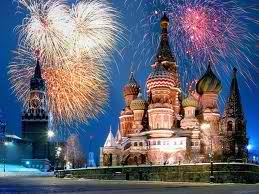 Red Square, a city square in Moscow (Russia), is a New Wonders of the World Runner-Up and a World Heritage Site. Red Square (the name actually meant “beautiful” in early Russian) separates the Kremlin, the former royal citadel and the current official residence of the President of Russia, from a historic merchant quarter. Red Square which measures 1100 feet by 230 feet (obviously not square) is surrounded by significant buildings including: Lenin’s Mausoleum, the ornate onion-domed Saint Basil’s Cathedral, the palaces and cathedrals of the Kremlin, Kazan Cathedral, the State Historical Museum, and the Iberian Gate and Chapel. 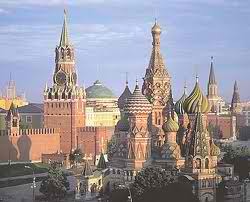 Red Square began to take on its current shape in the late Middle Ages with the construction of Saint Basil’s Cathedral. Red Square became the center of government and landing stage and trade center for Moscow. After the deposition of the Russian Czars, the Square served as a showplace for the Russian might and Lenin’s mausoleum. 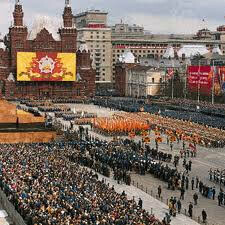 Today, Red Square remains a center of Moscow and Russian life.